In Photo: The opening of exhibits at the "AghamBayan: DOST-UP Science, Technology and Innovation Festival" at the PICC on June 20 starts with a ribbon-cutting, led by Science Secretary Fortunato T. de la Peña (third from left) and UP President Danilo Concepcion (fourth from left). 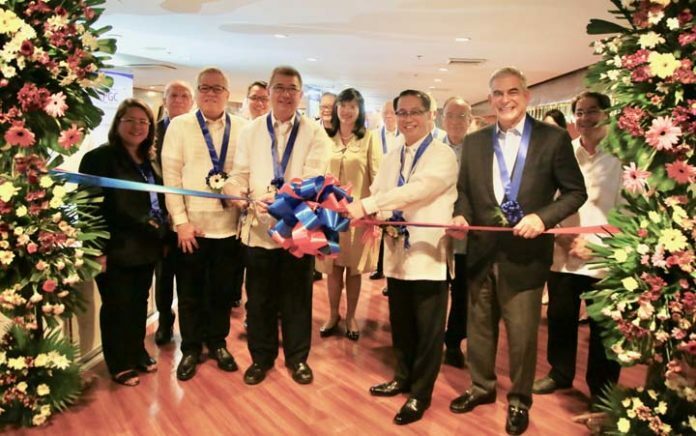 With them are (from left) Science Undersecretary Rowena Guevarra, Trade Secretary Ramon M. Lopez and Jaime Augusto Zobel de Ayala of Ayala Corp. (right). Dr. Carmencita Padilla of UP Manila and former UP President Emil Javier also graced the event. It was a science coup of sorts that the Department of Science and Technology and the University of the Philippines pulled through the "AghamBayan: DOST-UP Science, Technology and Innovation Festival" on June 20. The event was the first time that the "joint power, ingenuity and intellectual capacity" of the DOST and the UP System was celebrated, Science Secretary Fortunato T. de la Peña said in his message at the opening of the festival. AghamBayan showcased the science, technology and innovation (STI) products that were generated through the collaboration of DOST and UP scientists and researchers. It signifies how science contributes to the public good and its relevance to people's everyday life, the festival information sheet said. De la Peña and UP President Danilo Concepcion cited in their respective opening remarks some of the STI projects produced. Both leaders were proud in highlighting the DOST-UP tie-up in the PHL-Microsat Program that uses microsatellite technology for real-time and on-demand access to data that enhance local planning and decision support for climatology, disaster risk, mitigation and resource management. The project produced the first Filipino-built 5-kilograms microsatellite Diwata-1, which is still orbiting in space, and the soon-to-be-launched Diwata-2. Diwata-1 has high-precision telescope, which can determine the extent of damages from disasters, while Diwata-2 will have an amateur radio to enable communication among emergency responders, planners and affected communities during disasters, de la Peña said at the festival held at the Philippine International Convention Center in Cultural Center Complex in Pasay City. De la Peña and Concepcion also featured the DOST-UP collaboration in the Light Detection and Ranging (LiDAR) Data for Disaster and Exposure Assessment for Mitigation (DREAM) Program that produced high-quality, up-to-date, detailed and high-resolution, three-dimensional flood modeling and hazard maps that identify areas to be affected by typhoons or landslide. Concepcion also mentioned the positive impact of the dengue detection kit that has "high efficiency," unlike the costly conventional system. "Tatak Pinoy pa! [And it's a Filipino brand!]" Concepcion proudly said in his message delivered in Filipino. De la Peña noted in his message the STI initiatives in agriculture as the country maneuvers to achieve food security as it fights climate change. The "Smarter Approaches to Reinvigorate Agriculture as an Industry in the Philippines," or Sarai, de la Peña said, provides farmers modern tools and techniques to help them manage their farm in deciding on when to plant, crop suitability, early warning systems for pest and disease infestation, water management and daily weather conditions. He said the fungus Fusarium that causes the Panama disease that devastated the country's banana industry is being controlled by ACTICon—composed of naturally occurring soil microbes—and "is giving hope to saving the [country's] banana industry." The development of biofertilizers and nanofertilizers—such as Mykoplus, Mykovam, Nitro Plus, Nutrio and FertiGroe—have helped farmers in reducing production costs through environment-friendly and cost-effective alternative fertilizers. "These products improve nutrient and water absorption, as well as protect plants from pathogens," de la Peña said. He also mentioned the "astonishing" breakthroughs in health, including the Newborn Screening Systems for the early detection of possible mental retardation or morbidity of infants, and in the process save their lives. The popular "wonder plants lagundi and sambong" became household names. Lagundi is used as cure for cough and asthma, while sambong is used as anti-urolithiasis, which can dissolve kidney stones without the need for surgery. Among the highlights of the event are the panel discussions on industry and government. Industry leaders, including Roberto Amores of the Philippine Chamber of Commerce and Industry, Dan Lachica of Semiconductor and Electronics Industries in the Philippines Foundation Inc., and Michael Toledo of the MVP Group of Cos. discussed the importance of the synergy between industry and science. Amores raised his concern on the gap between science and industry, especially in the slow commercialization of researches. "The proof of the pudding is in the eating," he said. "The activity to commercialize is important. There is the technology, but we have to generate the bottom line that is to boost production and yield." He said the Philippines is far behind its Asean neighbors, such as Thailand, Vietnam and Indonesia, in export volume. "Let us walk the talk," he said. Toledo, who is an executive in Philex Mining owned by the MVP Group, raised the challenge to scientists in the need to mitigate the environmental disruption in the extraction of resources, such as the minerals used in cell phones and other modern gadgets. "What is important is that we provide the means of today for the future generation," he said. On the other hand, government officials—de la Peña, Health Undersecretary Rolando Domingo, Undersecretary Adoracion Navarro of National Economic and Development Authority and Assistant Secretary Rafaelita Aldaba—discussed the direction of STI in the country and how the government bridge STI researches for use by industries and other stakeholders. De la Peña said the Technology Transfer Act was able to help in commercializing researches and the researchers now gain from the outputs. At the same time, the DOST already has increased its budget to provide more funds to researches. Aldaba said the gap between the academe and the industry is being bridged through the signing of memorandum of understanding between the innovator and the entrepreneur. "The technology has to be brought to the market," she said. AghamBayan was attended by STI scientists and researchers, faculty members of different private and state colleges and universities, policy-makers, government officials, including Cabinet secretaries—such as Trade Secretary Ramon M. Lopez—members of chambers of commerce, industry leaders—including Teresita Sy-Coson of SM and Jaime Augusto Zobel de Ayala of Ayala Corp.—investors, entrepreneurs and local government units. The festival also held an exhibit that highlighted the collaboration's projects on health and well-being, environment, food and human resource development/job creation. Many of the projects are currently directly benefiting the government, industry and the public.